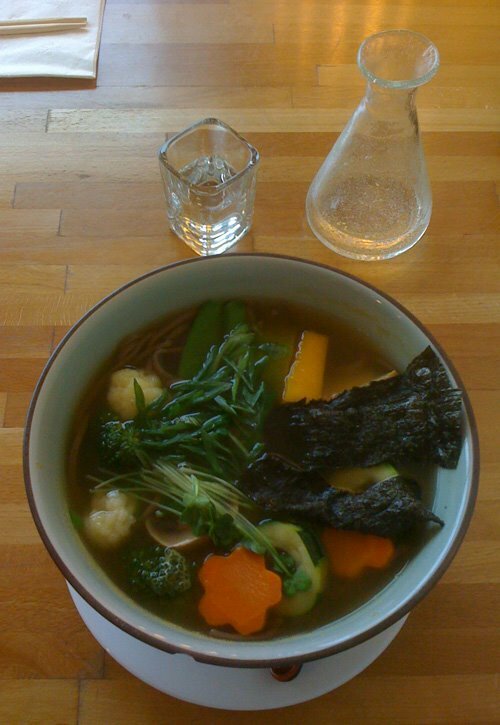 There are summer nights when a big, steaming bowl of yasai soba is THE perfect thing for dinner. Most summer nights in San Francisco involve wading through a thick, cottony, wet fog, so soup has obvious merits, but a really GREAT soba soup especially hits the spot. I don't think I've talked up Cha Ya Vegetarian Japanese Restaurant until now. It is located at 762 Valencia (near 19th Street), and it is a simple restaurant with white walls, bright lights, and clean wooden tables. It serves extremely fresh, nicely presented, simply flavored Japanese foods. What makes it stand out is that it is a Japanese VEGAN restaurant with more than 100 items on the menu, a short but pleasant sake menu, and a quiet, mellow feeling (once you have recovered from indecision paralysis over the vast array of options and menu combinations). The menu is so vast, it is hard to do it justice. In the interests of expanded knowledge, I have visited several delicious times. Their sushi - the glories of vegan sushi! - is tasty, and the sushi with tempura in it is novel. Their tempura is good, though the main reason I want to order it is because their togarashi (likely "shichimi togarashi"), a chili powder, sesame, and mixed spice condiment, is the tastiest I've had anywhere. All on its own, it is addictive. I would buy some if they sold it, and then abuse it terribly. The stuffed eggplant is exotic-looking and comes in a thick sauce, though it is slightly complicated to eat without breaking it into smaller pieces. The Cha Ya Nabe, which is a pretty array of veggies over glass noodles in a savory sauce, is fabulous. Blandness is an occasional side effect of a philosophy of Japanese cooking: each ingredient should carry its own flavor, and not be overpowered by the others. There is an emphasis on simplicity of seasoning for this reason in most Japanese dishes, and those of us who love chili-fires won't find that sort of burning satisfaction in this cuisine. The Japanese also enjoy sweetness with their dishes in places I expect savoriness, especially in cooked sauces. Certain on-line reviews fault the restaurant for blandness, and admittedly the only dish I haven't liked is the bland tofu custard with veggies stuck into it, but I found that to be an exception to the otherwise very delicious menu. Cha Ya serves fresh, delicately flavored, delicious, food from an impressively long menu. I recommend it for those who already like Japanese food, and who want to branch out from the boring, short list of options most places provide. I have added Cha Ya to my list of favorite San Francisco restaurants, and have made a few other, minor updates to the list. You would be frightened if you knew how well my November 2008 trip to Japan was documented. You might not be quite as frightened if I show these many types of documents to you in small, manageable pieces over long periods of time, however. So that is my approach. My Japanese Paper Fetish (facebook.com, no login required) is the latest installment of my encyclopedia of experiences, showing you another aspect of the visual artistry that I enjoyed there. Anecdote: Every rail line in Japan seems to have its own theme song. You'll pull into a station, and an electronic tune will burst out of the speakers: when the song ends, you'd better be on your train, because the doors will close. The songs are catchy. They can stick in your head for HOURS. A lot like the crosswalk song in front of Kyoto station, which I recorded and will share with you at some other time. I know that my iPhone photoblog at mobilelene.blogspot.com has been inadequate to feed the relentless demand for my vacation photos, even though I posted about 150 of them over the course of late November and early December. Also, to see the images in groups rather than in arbitrary sets of six, you have to view the November and December archives to see large groups of images at once. And that doesn't work for a lot of people. I have been posting sets of images from my "real" digital camera in Facebook, which kindly permits non-Facebook users to view the albums without any silly login or personal information disclosure requirements, in a very user-friendly format. -Japan - Kyoto between rainstorms, which also emphasizes roof details and fall color, but at different locations than the earlier sets. I will likely post one more album of Kyoto images to Facebook (though I'm not sure what to do with all the plant studies I took in the Kyoto botanical garden, most of which involve plants which are not native to Japan), and perhaps an 'iPhone greatest hits' collection of favorite photos from my photoblog there. I also have reports going about what I ate on the trip, highlights, cultural observations, and other details, which will reside on a page here at teahousehome.com, where I will also consolidate the links. Though I hope you're not holding your breath: it could take a while to get them all set up to my satisfaction. Stay tuned.